Quail food - What do quail eat? Best Food For Quail. Quail food - What do quail eat? When feeding quails or pheasants in the wild or at home, you can provide food plots that will serve as they natural hiding place. Food plots can be created by planting different types of bushes, garden plants that birds eat in the wild. This may include soybean, corn, rye, oats, blackberry, clover and other types. Bird feeder will help them if you install it and provide them with supplemental food source. Quail do not live long, and will have a short life span. They will live in small coveys that can range from just a few birds to even twenty. The small size of the colonies, one covey can be sustained on a ¼ food plots. Wild quails are under treat by man, and almost decimated and reduced in wild over the years by loss of habitat. Feeding quails in wild can help restore the numbers. If you plan to keep quail it is important to know what do quail eat. Quail are not migratory and will live all they lifes and die within the quite small areas that each covey occupies as their own home. 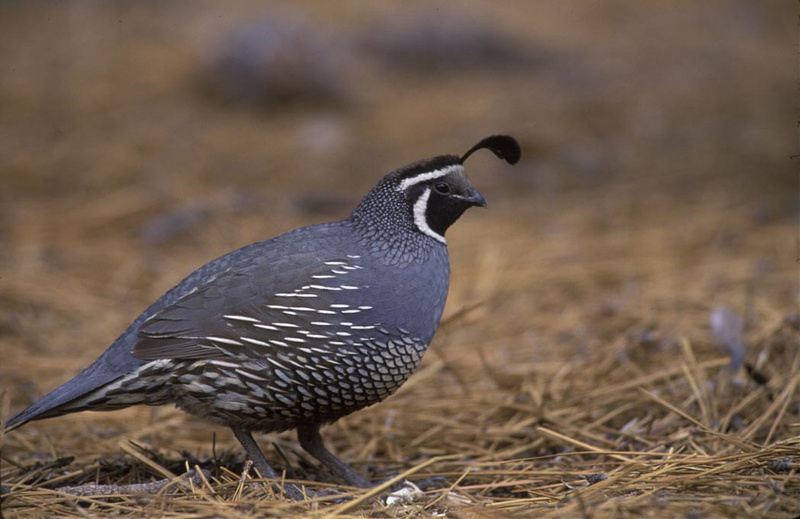 Quail can be found in most of the United States and Mexico. Bob white species are the most popular of which there are many sub-species in North America. If you want to feed quail, you must provide them with as much as natural diet as possible. What do quail eat & ingredients this birds require? There is a special blend of seed Game/Show Bird Feed , that is made from premium grain for quail, doves and pheasants birds. It is the best food for quail. You can feed the desired amount on the platform feeder that you will provide for your wild or captured quail. You can use a platform quail feeder or a dish that you install on the ground. Make sure to clean it from time to time, and provide fresh water next to it. You can feed all year long as quail are not migratory birds. Quails will not over – feed , you don’t have to worry about them eating to much, when they are full that will stop eating. Quails are small size birds, but will eat a fair amount of food. You can mash the pellets in smaller pieces if you are feeding small chicks. You can give them as much of Game/Show Bird Feed as they can eat as quail will not over-feed. If you want you can provide the birds with a little extra variation. It is good to keep the main food constant and just provide additional types like pasta, lettuce , sweet corn. Never give them salty food or meat, this is not good for the bird health. You will see if the birds are not eating it, you just stop giving it to them. You can provide drinking water in the wild but that is not a requirement, quails will find other water sources easily. If you have the birds in captivity then fresh water is a must. Keep it clean and make sure it never gets frozen. From time to time add Apple Cider Vinegar to help them get rid of the worms and parasites. This will also boost the feather condition. Add it in small quantities to the water. If you keep the water outside check it in winter as it can froze. Quail in the wild usually live in coveys from few birds to 100 in some cases. They will spend most of the time on the ground and fly when in danger from predators. These birds are good at running from danger and can out maneuver falcons and hawks and bobcats in dense bush. These birds can be seen near human settlements, in brushy lowlands, streamside areas and valleys. Often they will stay near corn and other fields where it is easy for them to hide from danger. All species of quail feed in a similar diet, insects, seed, nuts and different berries that grow in the wild. They will need water and shelter and will often be found next to these resources, that's why it is important to know what do quail eat. 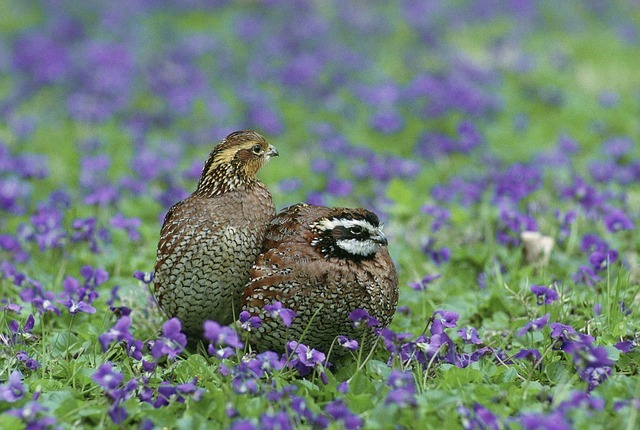 If you have land there are certain kinds of plants that will attract quail. Grasses and legumes will attract these birds as they offer seed to them. Other nice choices are sweet vetch, clover, and milk vetch. Quail need high protein food source and will come to eat food that is rich in these. That is even more important in colder time of year. This is a good time to offer extra food in quail feeders and help them in winter. Providing shrubs like berries such as snowberry, blackberry, huckleberry, currant, serviceberry, manzanita are very rich source for the birds diets. Some native trees such as ash, cascara, oaks and hazelnut will offer edible seeds or nuts that can be valuable food source for them. Quails are ground feeders and will come to feeders provided for them on the ground. Provide cracked corn, millet and other grain for them. Predators can come and prey on the feeding quails so install them where these birds can hide easily and run away. Cats may try to prey for them so make sure cats are not around. Here is a great book about Urban Quail-Keeping, The book has a wealth of valuable information for anyone starting out or already keeping quail in an area such as a back garden, patio or even balcony. You can install water for them if you like, it is a good idea to do this in dry areas where water is not always near. If you install a large container that you can put in the ground where you dig a hole. These container can collect rainwater and provide a valuable resource for the birds. Other option is to dig a hole in the ground and line it with waterproof material as plastic, and then fill it with water. Many conservation agencies build these kind of water sources where climate is dry and birds may have problems in finding fresh water. Quail need places to rest and roost when not active, and will need places to nest. Large trees are favorite for these birds, and they will roost there happily. If not in the area artificial platforms can be constructed for this purpose. Large wire platform will provide good protection from predators that lurk from the ground. 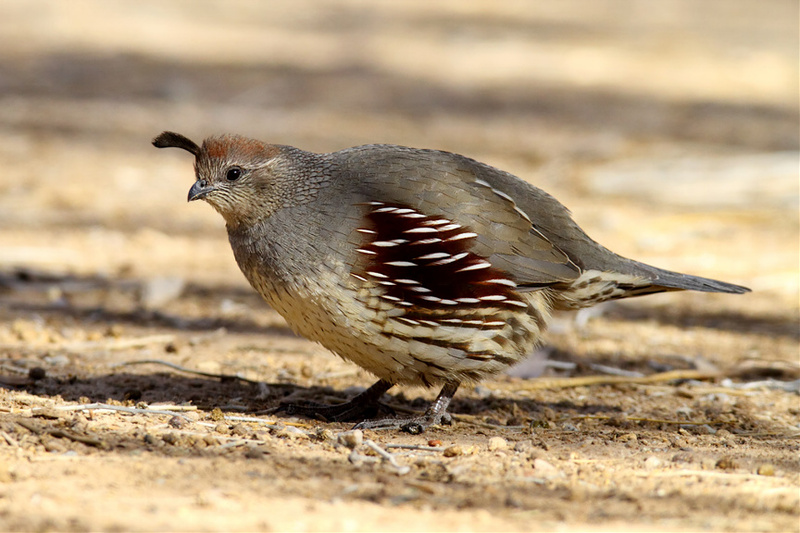 Shrubs and high grass and other thick vegetation is also favorite by quails as hiding places. If you have space leave some of those areas on your land. 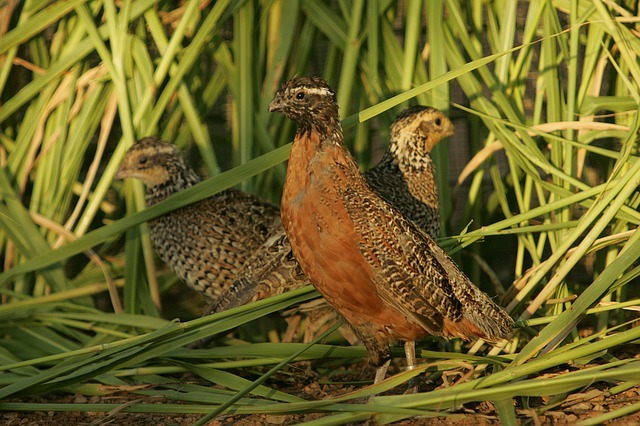 Lack of natural hiding places makes it challenging for quail to thrive in the wild. If possible leave some of those areas to protect these birds and help them raise the young. When keeping quail in your backyard we must be careful of rats. Make sure rats will not invade their space looking for food. Rats will be attracted to quail droppings and food so keep the area clean at all times to minimize the problems. Keep the quail with an open space to walk around, give them grass and other vegetable green to supplement their diet to keep them happy. You can get special quail made housing or convert the one you have at this moment. Rabbit hutches can be a temporary solution, but note that wire flour on going to hurt quail legs so find the one with wood or similar bottom. Chicken coops are good but often to big for smaller quail. Chicken nest boxes are usually made for bigger size but quail will still use them and will appreciate a dark place to hide to produce eggs. Quails don’t need perches so you can remove them from the Outdoor Wooden Poultry Coop Backyard Run , they will spend their time on the ground looking for food and sleeping in some dark corner. Quails are similar to pheasants when habitat is chosen. You can mimic that by providing some old branches and bushes where these birds can hide. Logs arranged to provide cover are great as quail love to find shelter under things when sleeping or feeling scared. Build them a safe environment and they will live a long life. When winter cold temperatures arrive make sure you provide additional insulation to keep them warm. You can do this buy getting extra bedding material so quails will feel warm. If you want you can move quails to a garage or some other sheltered place but they are well equipped to stay outside as long as you give them good bedding and a place (small house) to hide and keep them self warm. If you have strong winds a suggest you place you quail coop where he wind will not blow directly or cover it. This can be done by a simple plastic cover you buy in most shops and it will not cost you much, it will also provide cover from rain. Like we said quails are ground birds and will not climb to roost in houses elevated high up. Place your quail house on the ground so they have clean access to it. Rats and mice will look for food so clean it on regular intervals to prevent rodents infestation. Place some grass inside to provide nesting places and warm spots for spending the night. Quail will love fresh grass under their feet so I suggest you change it when ever you can to keep them happy. Sawdust is also not bad and can be a good insulator in cold winter nights and can be cleaned easily. If you provide all this to your birds you can enjoy lots of fresh eggs from your birds. I hope you have lots of happy and great days with your quail and happy birding! Check the Manna Pro Game/Show Bird Feed here.